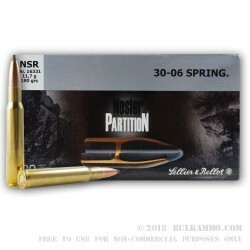 The Nosler Partition bullet was released in 1948. It’s been going strong since then. It’s still considered an ultra-premium projectile. 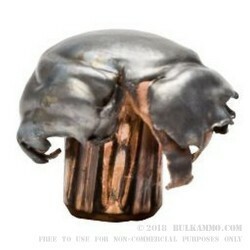 This “2 piece” bullet design can almost ensure 100% uniformity in expansion and guarantees mushrooming while offering some of the highest weight retention of any projectile, despite being made of lead in the core. It’s an excellent bullet for any type of hunting and it does the job well, even if it is mature by today’s standards. This is a Sellier & Bellot load that features the 180 grain Nosler Partition bullet loaded to be a heavy game cartridge with a Boxer primed brass case and built to a stout performance specification. The ballistics for the round as stated are 2444 feet per second velocity and 2386 ft. lbs. of energy delivered at the bore. Sellier & Bellot is a premium cartridge manufacturer with a wide range of .30-06 Springfield offerings – this is among their best from a performance and capability perspective. That says more about the value of the Nosler bullet than it discounts about the in-house projectile from S&B. The trust hunters have in proven technology like the Partition design and in S&B: a stalwart, reliable company that produces top tier ammunition. Q: What is the velocity? Q: Would this round be good for feral hogs? A: Yes, this would be a good choice. 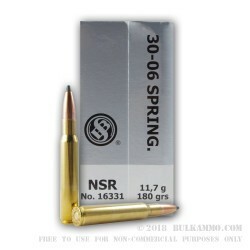 The Nosler Partition bullet is an excellent choice for hunting, and 180gr .30-06 bullets in general have more than enough penetration for feral hogs.